Thank you again to everyone who has donated and supported us in replacing our roof. We are halfway to our goal on GoFundMe, and I am continuing to call roofing companies for an estimate on the cost of replacing it. The past couple bids we’ve received are higher than we would prefer – one was around $7,500 and another was around $8,500 – but we’ve received one cheaper estimate that is more in our price range. The companies giving us the higher bids want to do more than the basic roof replacement. 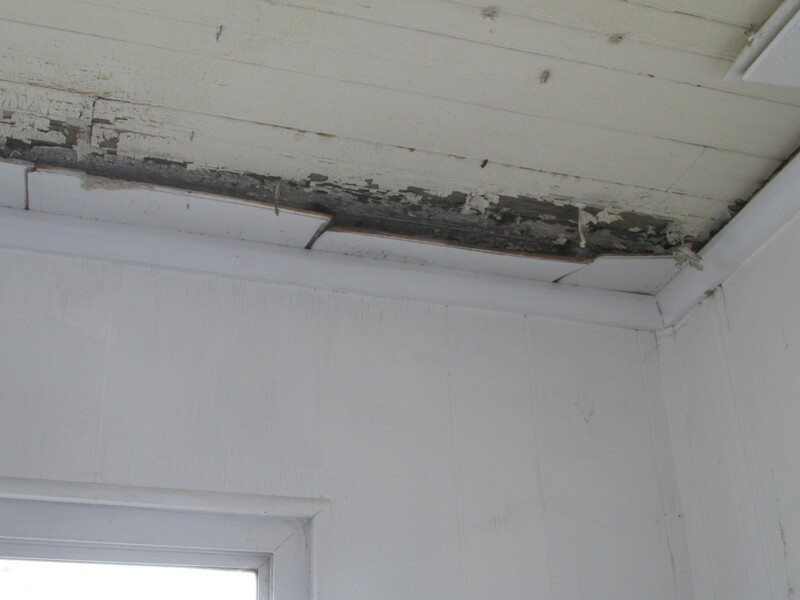 Besides some costly improvements they want to make, they are factoring in the price of replacing some of the wooden beams in our ceiling that have taken water damage. I am still calling around in hopes of getting a more affordable bid; I’ll post another update as soon as we decide which roofers to go with. My plan was to have the job done this month (December). But depending on whether we get an affordable estimate from a reputable company in the next couple weeks, as well as the amount of funds we raise in that time, I may need to extend the fundraiser into next year. I think we will soon have enough to replace the roof, which is something I never thought I would be able to do anytime soon. It is amazing beyond belief that so many people have helped us, whether by donating or sending love and kind words. We are accepting contributions via GoFundMe (link above) and PayPal (my PayPal email is wesremal@yahoo.com) The first update, along with the original post and photos of our damaged roof, is below. Thank you so much to everyone who has donated to our new roof fund and sent us positive comments. With the donations made to our Go Fund Me and the donations sent via PayPal, we are closer to our goal than I would’ve ever thought possible. I’m currently calling around, having a few more companies come look at the roof and give an estimate of what it will cost to replace. One roofer said while looking at it that it has taken a great deal of hail damage, which has caused the nails to loosen and water to get in. This is why our ceiling has taken water damage, as you can see in two of the pictures below. Showing me up-close pictures of the asphalt shingles, he made it clear that hail has significantly damaged the roof. This confirms that it needs replaced ASAP. I don’t yet have the pictures he took, but I will update this (and the Go Fund Me) as soon as he sends them to me. I have two other companies coming by in the next few days to look at it and give me an estimate, so for now we are unsure what the final cost will be. As I mentioned, we are closer to the amount we think we’ll need. But we’re not out of the woods yet. I cannot express my appreciation enough to everyone who has donated, and apart from the contributions made via Go Fund Me – for which I have not yet thanked all the donors – I am trying to thank each of you individually. If we can continue to get contributions, then I’m confident that we’ll have enough for this frighteningly expensive repair. As I wrote in my original post, we will greatly appreciate anything you can give. If you enjoy my writings and want to help support the blog, then right now this is the best way to do so. We are also accepting contributions via PayPal – my PayPal email is wesremal@yahoo.com. I’ll post another update for the roof fund in the next few days – likely after Thanksgiving as it will be a busy time for everyone. The original post, along with photos of our damaged roof, is below. For anyone who can help – our roof is badly damaged and in need of replacement. It is sagging in some areas, and in some rooms of the house, the ceiling has visible water damage. One roofing company estimated that it will cost at least $5,000 to fix, but it could cost more if the roofers discover more damage. Here are some pictures of the damaged, sagging areas of the roof as well as two photo of water damage in the ceiling in two of our rooms. We currently have no money for repairs, and so I’ve set up a Go Fund Me page with a goal of $6,000. We need to raise the money for this ASAP, as the damage is getting worse. We hope to replace the roof this winter. If you enjoy my writings and want to help ensure I can continue to write, please donate to the emergency fund we are raising via Go Fund Me. You can also donate via PayPal (my PayPal email is wesremal@yahoo.com). This is our last chance to raise money for the new roof we desperately need, and we will greatly appreciate anything you can give. We would also appreciate if you can share our Go Fund Me page on your social media. The more people who share it, the more who will see it and the more who can potentially help. Thank you all, and much love. This entry was posted in Wes' Articles and tagged fundraiser, new roof, update. Bookmark the permalink. Update #4: New Roof Fundraiser – Great News!